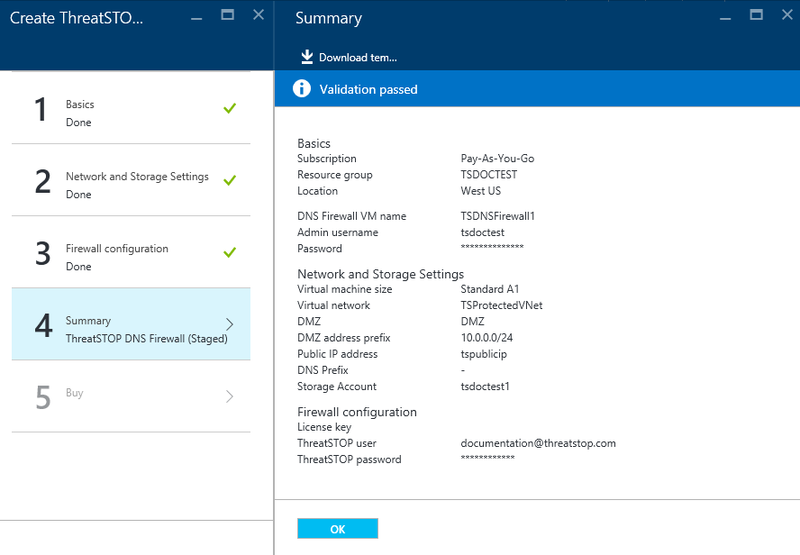 This document describes the integration process of the ThreatSTOP IP Defense with Linux IPTables server running on Microsoft Azure. 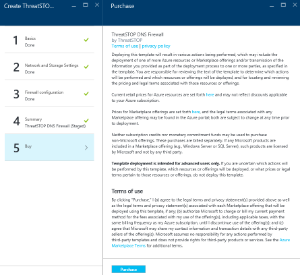 Setting up the ThreatSTOP IP firewall on Microsoft Azure is a straightforward process that should take less than an hour to fully complete. After initial setup and testing, your ThreatSTOP IP Firewall can be in place, and defending your network by blocking inbound and outbound connections to malicious IP addresses. Click on the ThreatSTOP IP Firewall link. Provide a Password or SSH Key. Create a new resource group and provide a name. Select a datacenter location for your virtual environment. 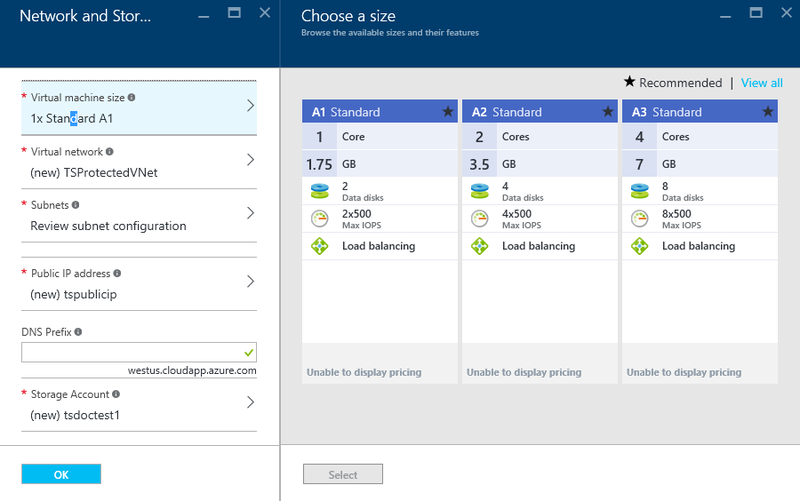 Create a Virtual network, or select one that exists in the datacenter to which the network is being deployed. Create a subnet. A new sub-net will need to be created prior to deployment for the IP firewall if one does not already exist. For testing purposes you may wish to deploy a new virtual net alongside an existing vnet, and then roll the servers into the existing vnet if they meet approval. Enter the License/API key you copied in ThreatSTOP Account Setup above. Verify that everything looks correct and click OK. 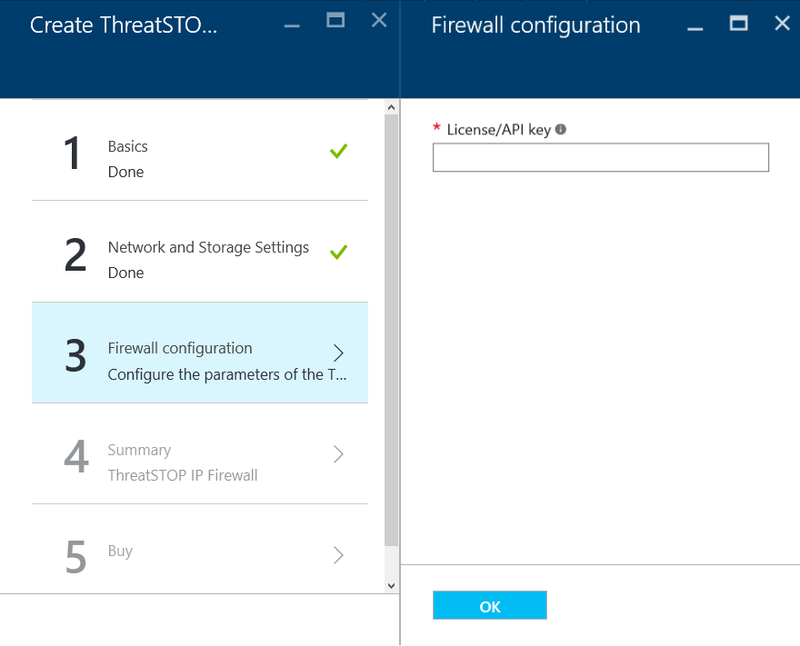 This will begin deploying the ThreatSTOP IP Firewall into your Azure instance, including creating a Resource Group, firewall VM, and adding your new device to your ThreatSTOP account. You can verify that the deployment to your account was successful by logging into https://www.threatstop.com and looking for a device that has a numeric nickname and has its Manufacturer / Model set to Microsoft / Azure IP Firewall. If this appears then the deployment was successful and you can move on to Testing the IP Firewall or Final Subnet Configuration. Before deploying the IP Firewall into your live environment, it is advisable to test that the firewall is performing as expected. One way of doing this is to deploy a temporary VM into the Clients subnet, connect to both it and the firewall, and monitor for traffic flowing across the firewall. 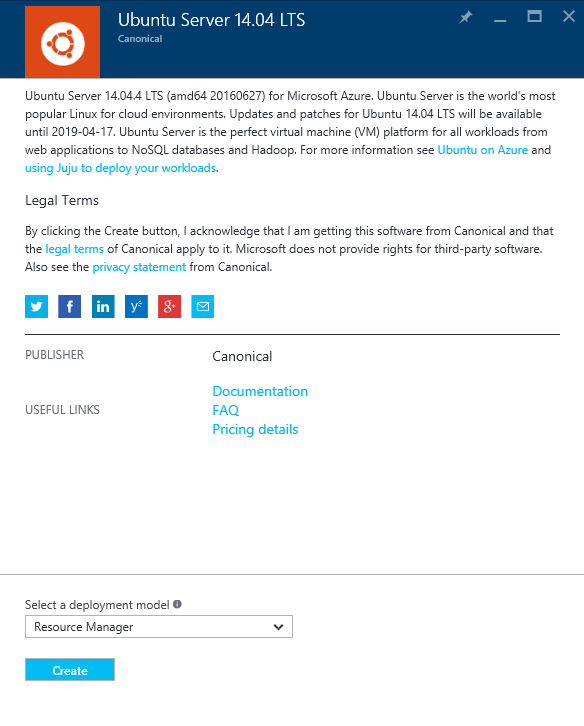 In Azure deploy a new Ubuntu clientVM into the same resource group as the IP firewall. For our example we are going to use the existing TSProtectedVnet but make sure the clientVM is assigned to the Clients subnet. Choose none for Public IP address as this will be a private subnet. Choose none for Network Security Group (NSG) for simplicity. Click on OK to bring up the Summary of the VM device. Click on OK again begin deploying the test VM. Associate it with the Clients subnet. PING bing.com (204.79.197.200) 56(84) bytes of data. PING bad.threatstop.com (64.87.3.133) 56(84) bytes of data. At this point if testing proved successful you may associate your Clients Subnet with the Route Table created during deployment. Caution: These instructions are a simulation of the steps you will perform to go live in a production environment. Click on the Route Table created by the solution template and associate it with your production subnet. Note: Implementing the route table is a critical step, as it routes all traffic from your network through the new firewall VM. Due to this, all testing needs to be completed and verified as working. If your setup is not correct changing this association can impact your Internet access. Click OK to finalize deployment of the IP Firewall. Login to the ThreatSTOP portal. Click on the Edit Icon next to the device undergoing the policy change. Select the Policy you want to use, then click Next, and close the window. Click on the Documentation icon, to open this document in the portal. Use SSH to login to your IP Tables firewall. [INFO ] : Proceed (Y/N)? This will update the policies on your IP firewall device to match your ThreatSTOP account.